Hospital Information System, Hospital Management Information System & Hospital Management System software are synonyms of hospital e-Governance initiatives, which means making a hospital management paperless. This includes the clinical, back office and generic management of all activities. Canny Ac integrates the entire resources of a hospital into one integrated software solution. A simple to use Electronic Medical Record & Hospital Management software for Clinics and Clinical Software Chains. Hospital Information System, Hospital Management Information System & Hospital Management System software deployed on your Local Area Network or the Cloud as per your need. Provide Accessibly, On Time and Patient Centric care with managed Workflow and Reminders. Hospital Management Software (CannyAc) is designed and developed by Adysoft for multi specialty hospitals, to cover a wide range of hospital billing management and administration system processes. It is a computerized Hospital Management Software in India developed to help hospitals for managing and maintaining the patient related information in a structured and systematic way. Best Hospital management software validates user errors, shows current status of indoor-outdoor patients, and does automatic calculations of various voucher related transactions like outdoor Receipt, pathological and radiological bill etc. The system also generates standard patient case history report, tests report and financial reports instantly and accurately. It is based on a carefully designed database structure, which effectively eliminates data redundancy and follows strict data and business constraints. 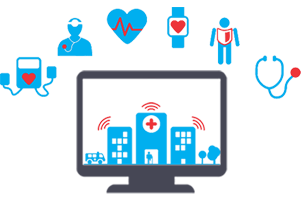 Hospital Management software (CannyAc) is fully equipped to meet the demands for running modern Hospitals or Clinics.